West Glamorgan (Welsh: Gorllewin Morgannwg) is a preserved county and former administrative county of Wales, one of the divisions of the ancient county of Glamorgan. West Glamorgan was created on 1 April 1974, by the Local Government Act 1972 from the county borough of Swansea, the municipal boroughs of Neath and Port Talbot, the urban districts of Glyncorrwg and Llwchwr, Gower Rural District, Pontardawe Rural District, and all of Neath Rural District except the parish of Rhigos. From 1982, the main council offices were located in County Hall, Swansea. Following the Local Government (Wales) Act 1994, West Glamorgan and its component districts were abolished on 1 April 1996, the area being divided into the two unitary authorities of Swansea and Neath and Port Talbot (later changed to "Neath Port Talbot"). Lliw Valley was partitioned between the two authorities. 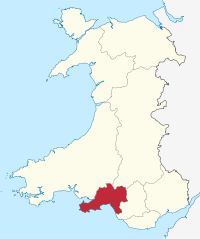 A West Glamorgan preserved county was created for the limited functions of Lieutenancy and High Shrievalty. The arms of West Glamorgan were: Argent three chevronels gules, between in chief two pine cones vert dimidiating as many gouttes sable, and in base a lozenge sable. The crest is a Welsh dragon holding a Tudor rose in its forepaws, rising above four gold cogwheels. The supporters are an osprey and a heron, both with a fish in their beaks, and wearing a chain round their necks. The osprey is standing on water, and the heron on a ploughed field. The motto is Cadarn pob cyfiawn (Welsh: The just are strong). The chevronels derive from the arms of the de Clare family; the pine cones represent forestry; the black drops (gouttes) the oil industry; and the black lozenge, coal. The four cogwheels above the shield stand for the four districts and their industries; the chains around the supporters' necks, the steel and aluminium industries; the water and the fish, fishing; and the ploughed field, agriculture. ^ 2007 population estimate, calculated using 2003 borders for Swansea and Neath Port Talbot. Source: "Table 10: Mid-2006 to Mid-2007 Population Estimates, Components of population change for local authorities in the United Kingdom". Office for National Statistics. Retrieved 2010-09-11. ^ "West Glamorgan coat of arms". Heraldry of the World. Retrieved 30 March 2014.